sage that nothing is impossible. These bridges are wonderful and amazing structure that are made to connect to place in very high condition. One of the problems with the height is the gravity itself. Following are the 10 highest bridges of the world. 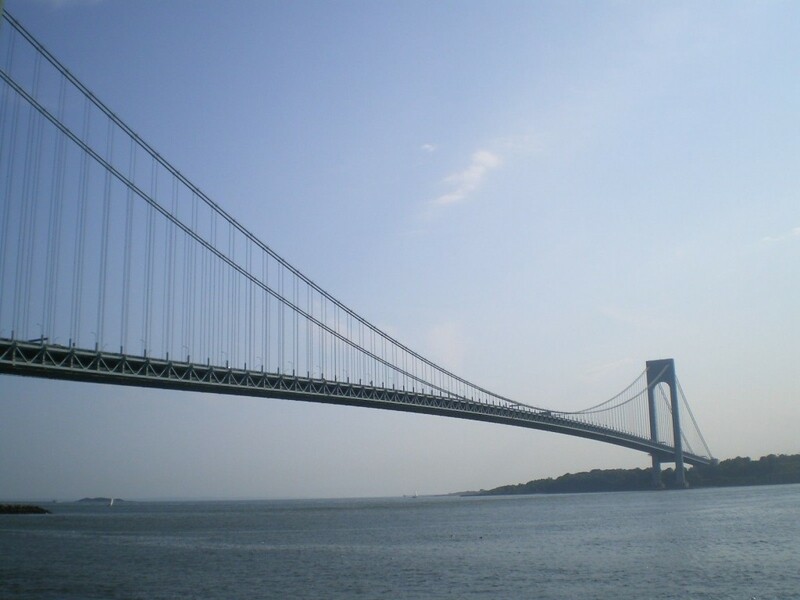 The Verrazano-Narrows Bridge is named after the famous Italian explorer Giovanni da Verrazano. This bridge has a height of 211.3 meters making it the 10th tallest bridge in the world and has a central span of 4260 feet (1298 m). Built in 1964 until 1981 it was the largest suspension bridge in the world. The bridge connects Brooklyn with Staten Island and has played an important role in the development of the Big Apple area. The construction cost was about $320 million. The Runyang Bridge is a large bridge complex that crosses the Yangtze River in Jiangsu Province, China, downstream of Nanjing. The bridge is part of the Beijing-Shanghai Expressway. This is a suspension bridge with a main span of 1,490 meters (4,888 ft) and a height of 215 meters (705 ft). The width of the deck is 39.2 meters (129 ft), accommodating 6 traffic lanes and a narrow walkway at each outside edge for maintenance. The total length of the bridge complex is about 35.66 kilometers (22.16 mi). 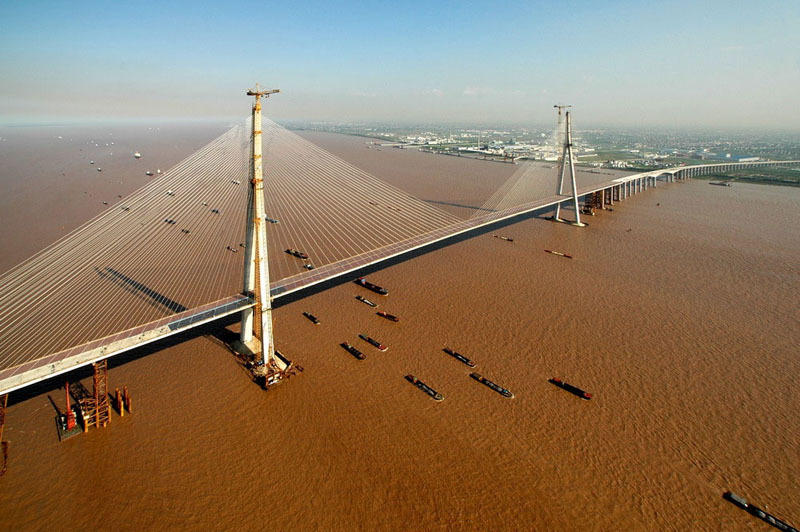 Construction of the bridge complex began in October 2000 with a cost of 5.8 billion Yuan (about US$ 700 million) and opened to traffic on April 30, 2005. The Pont de Normandie is cabled-stayed bridge that spans the river Siene to Normandy. Its total length is 2,143.21 meters (7,032 ft) and a height of 215 meters making it the 8th tallest bridge in the world. The bridge opened on 20 January 1995 and was considered to be the longest cable-stayed bridge in the world, and had the record for the longest distance between piers for any cable-stayed bridge. It was more than 250 meter longer between piers than the previous record. Its record for length for a cable-stayed bridge was lost in 2004 to the 2883 meters of the Rio Antirrio. At the end of construction, the bridge had cost $465 million. 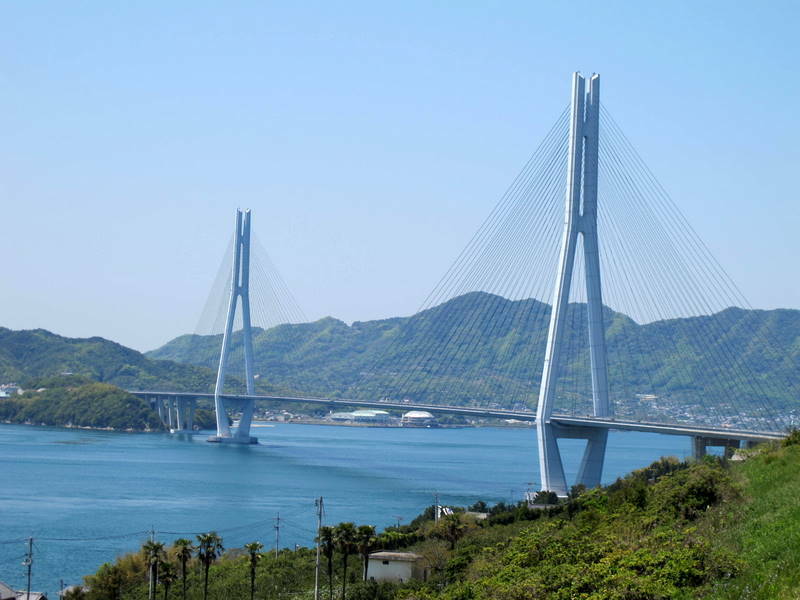 The Tatara Bridge links the Japanese islands of Honshu and Shikoku across the Seto Inland Sea and is known to have the longest span of any cable-stayed bridge in the world. It has 220 meter steel towers and has a center span of 890 meters. This Japanese marvel opened in 1999 and is part of the famous Mishieto Expressway. The bridge took a mere six years to build and has been made structurally sound enough to withstand big earthquakes. It is Japanese engineering ingenuity at its finest. The 227.4 meter high Golden Gate Bridge is a suspension bridge spanning the Golden Gate, the opening of the San Francisco Bay into the Pacific Ocean. 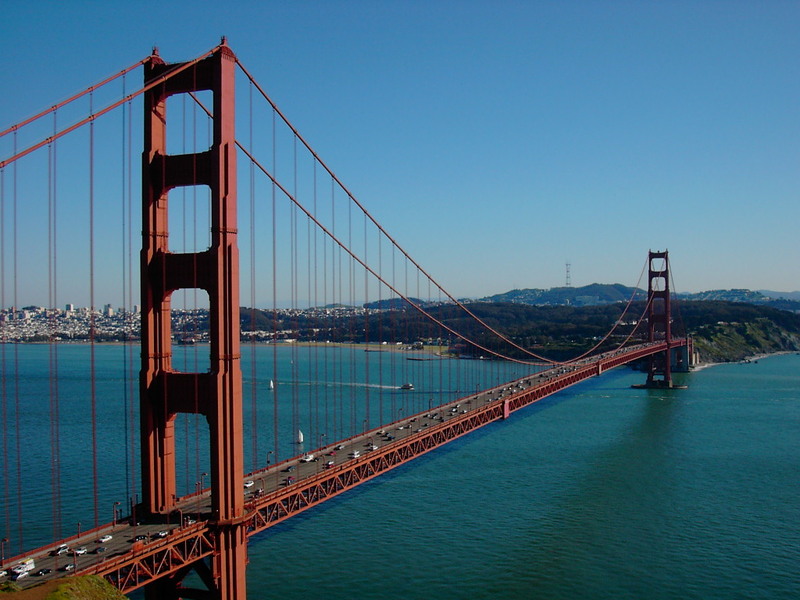 This bridge was considered to be the longest suspension bridge in the world when it was completed during the year 1937, and become one of the most internationally recognized symbols of San Francisco and California. It has been declared as one of the modern wonders of the world by the American Society of Civil Engineers. Construction of this began on January 5, 1933 and completed by April 1937 with the cost of more than $35 million. 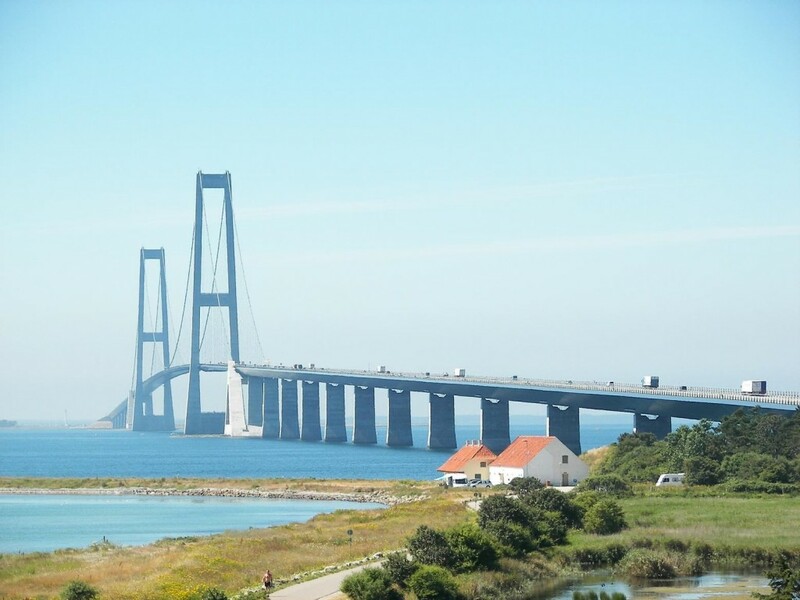 The Great Belt Fixed Link bridge is Europe’s highest and connects the Zealand and Funen islands of Denmark across the Great Belt. Completed in 1998, it has a height of 254 m and consists of a road suspension bridge, a railway tunnel and a box girder bridge. The term “Great Belt Bridge” ordinarily pertains to the suspension bridge (but may also refer to the whole link) and is considered to have the world’s second-longest free span at 1.6 km. As in other cases of major bridges, its construction has paved the way for better businesses in the region. This in the long run may well justify the massive bridge construction cost spent – DKK 21.4 billion, the most costly in the history of Denmark. 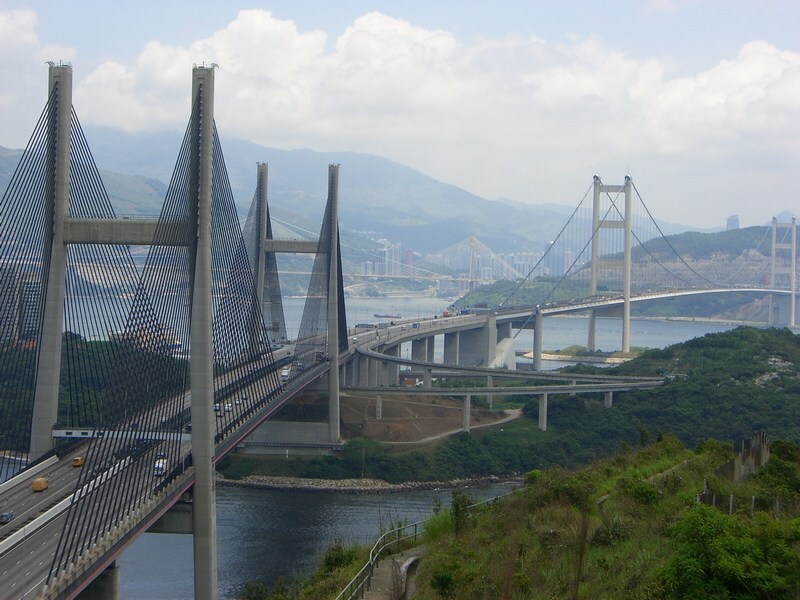 Stonecutters Bridge is a high level suspension bridge which spans the Rambler Channel in Hong Kong, connecting Nam Wan Kok Island and Stonecutters Island. The bridge has a height of 298 meters making it the 4th tallest bridge in the world. Construction of the bridge started on 27 April 2004 by Hitachi Chong joint venture costing HK 2.76 billion and opened to traffic on 20 December 2009. The bridge is part of Hong Kong’s Route 8 connecting many parts of Hong Kong. The interesting challenge and extreme difficulty in constructing this bridge, was featured on the Discovery Channel’s Extreme Engineering series on April 27, 2009. 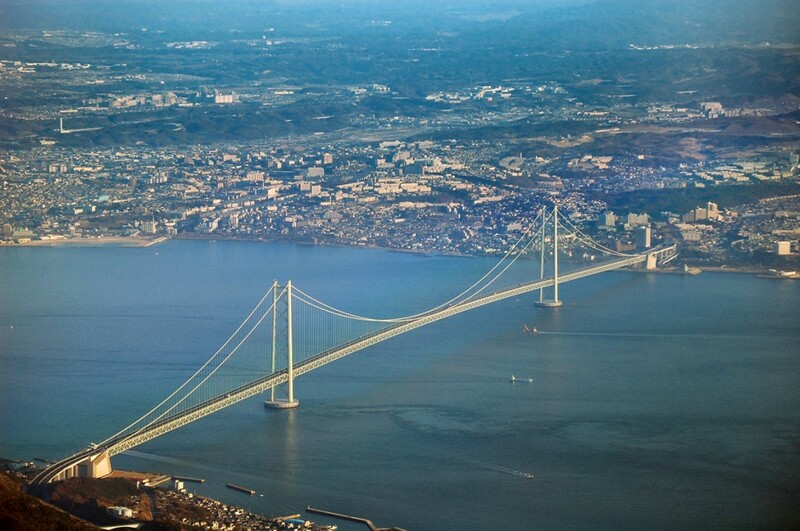 The Akashi-Kaikyō Bridge, also known as the Pearl Bridge, has the longest central span of any suspension bridge at 1,991 meters (6,532 ft) and a height of 298.3 meters. It is located in Japan and was completed in 1998. The bridge links the city of Kobe on the mainland of Honshu to Iwaya on Awaji Island by crossing the busy Akashi Strait. It carries part of the Honshu Shkoku Highway. The Sutong Yangtze River Bridge: It is a cable-stayed bridge that spans the Yangtze in the China between Nantong and Changshu a city in Jiangsu province. With a span of 1,088 meters (3,570 ft), it is the cable-stayed bridge with the longest main span in the world as of 2010. Its two side spans are 300 meters (980 ft) each, and there are also four small cable spans. 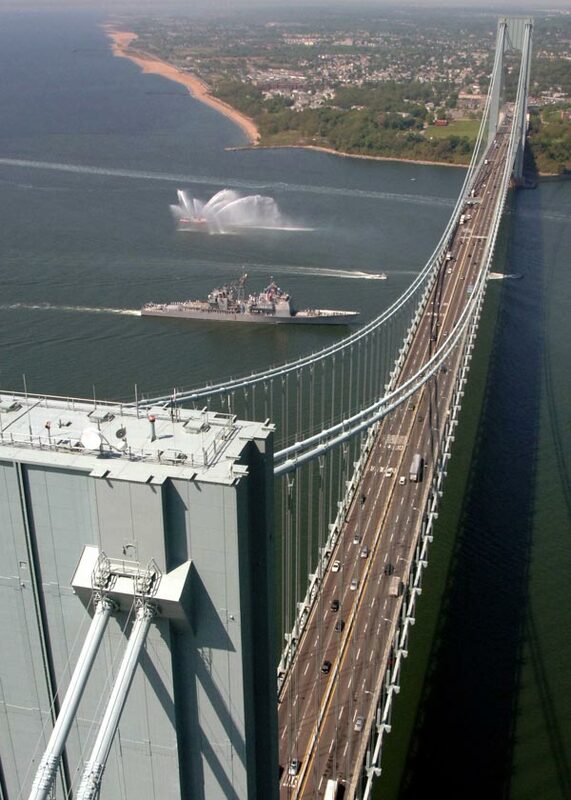 Two towers of the bridge are 306 meters (1,004 ft) high and thus the second tallest in the world. The total bridge length is 8,206 meters (26,923 ft). Its construction began in June 2003, and the bridge was linked up in June 2007. The bridge was opened to traffic on 25 May 2008 and was officially opened on 30 June 2008. The cost of its construction was estimated about US$1.7 billion. 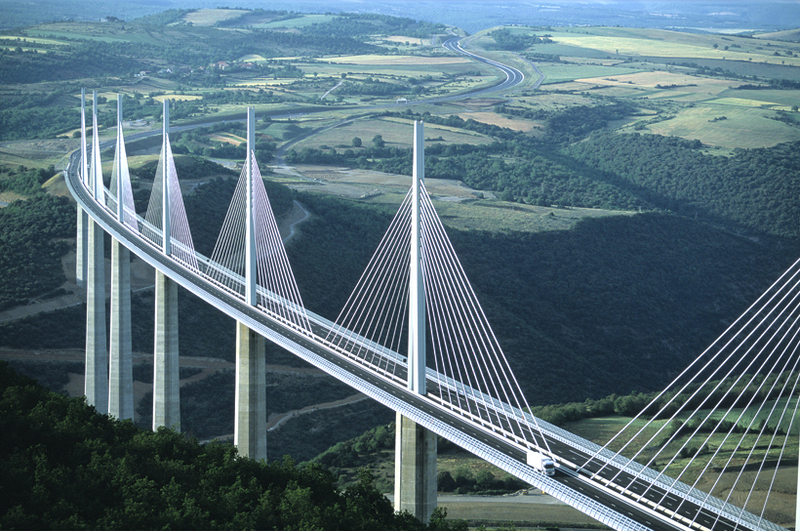 The Millau Viaduct, is a cable stayed road bridge that spans the valley of the River Tam near Millau in southern France. It is the tallest bridge in the world with an impressive height of 343.0 meters (1,125 ft) a little shorter then the Empire State building and taller then Eiffel tower. This massive structure has even been featured in the National Geographic show “Megastructures.” The Construction cost was approximately 400 million Euros and it was formally opened to traffic on 16 December 2004. 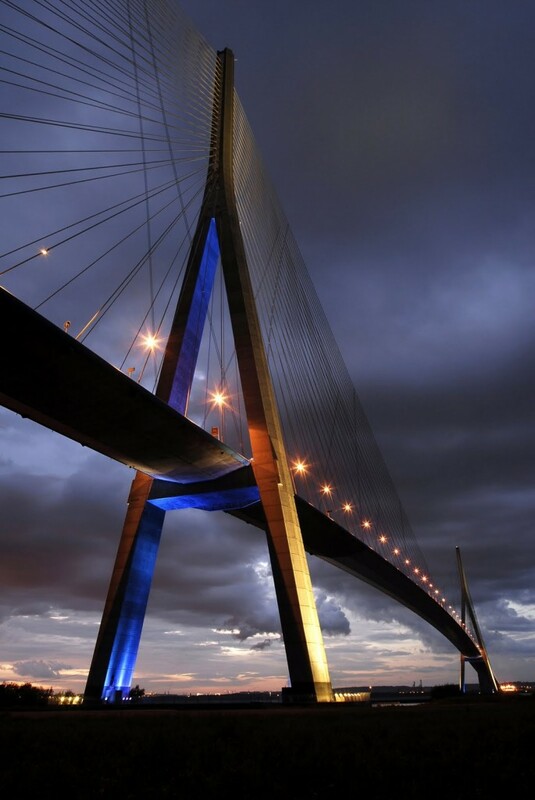 The bridge has received IABSE Outstanding Structure Award in 2006.